Melt 1/4 cup butter; mix with baking crumbs until blended. Press onto bottom of 9-inch springform pan. Beat cream cheese, 3/4 cup sugar and vanilla in large bowl with mixer until blended. Add eggs, 1 at a time, beating on low speed after each just until blended; pour over crust. Bake 40 to 45 min. or until centre is almost set. Run knife around rim of pan to loosen cake; cool before removing rim. Refrigerate cheesecake 4 hours. Meanwhile, bring cream, bourbon, remaining butter and sugar to boil in saucepan; simmer on medium-low heat 7 to 10 min. or until slightly thickened, stirring constantly. Cool. Refrigerate until ready to serve. 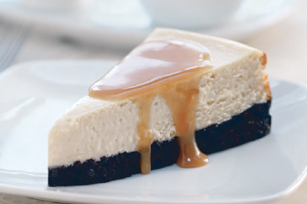 Pour bourbon sauce into microwaveable bowl when ready to serve cheesecake. Microwave on HIGH 30 sec. or just until warmed; stir. Spoon 1-1/2 Tbsp. over each serving of cheesecake. For added flavour, blend additional 2 Tbsp. bourbon into cheesecake batter along with the vanilla. Substitute 1 tsp. rum extract for the bourbon.